From 1775-1783 Americans fought to liberate themselves from British rule under King George III. The American Revolution began a worldwide democratic movement that continues to this day. Artist Randy Green has created a masterful puzzle image of this somber and heroic conflict. Item 271: 1000 piece jigsaw puzzle: Finished size 24" X 30". 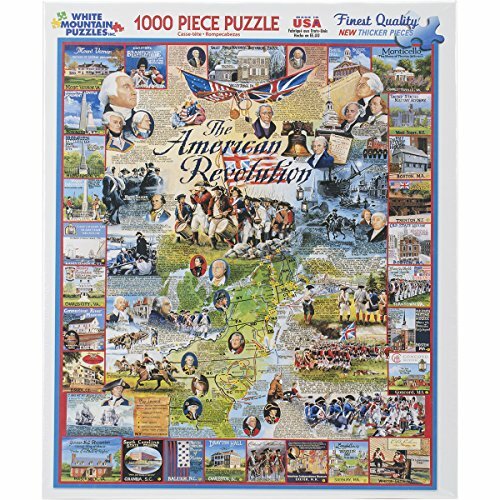 Features include: American Revolution Artist Randy Green Made in USA Recycled materials 1000 pieces Recommended Ages: 12 and up; From the Manufacturer; From 1775-1783 Americans fought to liberate themselves from British rule under King George III. The American Revolution began a worldwide democratic movement that continues to this day. Artist Randy Green has created a masterful puzzle image of this somber and heroic conflict. Item 271: 1000 piece jigsaw puzzle: Finished size 24" X 30".